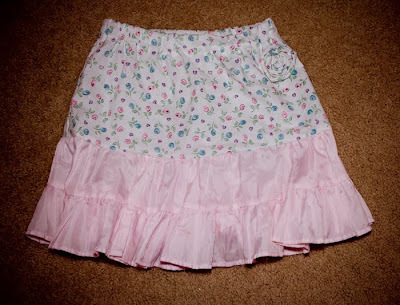 So my 4 year old had a pink twirly skirt that she just loved, wore it everywhere. It lasted all of three months before it was torn while playing outside. I never threw it away and instead salvaged some of the ruffles for a new skirt. The flower fabric was on clearance for less than $1. And miracle of miracles, I think this was the first piece of clothing I've sewed without using a pattern or online tutorial to guide me through. Woo hoo! Does that mean I've passed basic-elastic-waisted-skirt 101? 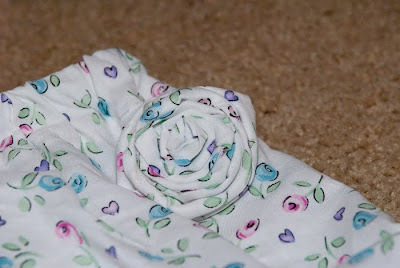 I added a little fabric rosette to the side just for fun.